Anyone--no matter how young--can make a difference Meet 50 incredible kids who had a positive impact in their communities . . . and the world. 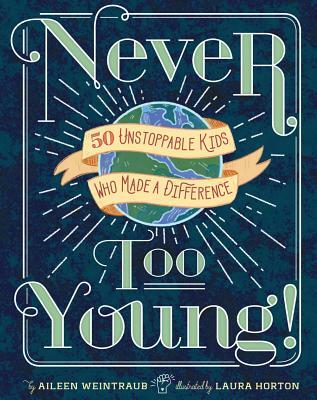 From Picasso, who changed the art world forever, to Malala Yousafzai, the brave teen who was shot for advocating education for girls, the 50 kids profiled in Never Too Young will inspire and empower young readers. Some, like Anne Frank, Ruby Bridges, and Stevie Wonder, are prominent figures, while others are lesser known though their achievements are just as compelling. They come from a variety of historical periods and backgrounds, and have made an impact in politics, sports, the arts, science, and more. Includes: Louis Armstrong, Louis Braille, Ruby Bridges, Thandiwe Chama, Michael Chang, Nadia Comaneci, Kelvin Doe, Bobby Fisher, Anne Frank, Tavi Gevinson, Om Prakash Gurjar, S.E. Hinton, Askrit Jawal, Joan of Arc, Helen Keller, Wolfgang Amadeus Mozart, Pel , Pablo Picasso, Pocahontas, Sacagawea, Shirley Temple, Venus and Serena Williams. Stevie Wonder, Malala Yousafzai, and more. Aileen Weintraub has written more than 50 books for children and young adults with companies including Sterling, Scholastic, and Simon & Schuster. She has also written numerous essays and articles for Scary Mommy, the Manifest-Station, and Kveller, among others. She lives in New York and is currently writing a memoir. You can find out more about Aileen at aileenweintraub.com. Laura K. Horton is a freelance illustrator whose work has been featured in juried exhibitions and competitions, including the 2014 Society of Illustrators Student Scholarship Exhibition and the MIAD Senior Juried Exhibition. Previous clients include Macmillan Children's, Hallmark Cards, and Quarto UK. Laura currently lives in Espoo, Finland, where she is obtaining an MA in Game Design and Development.